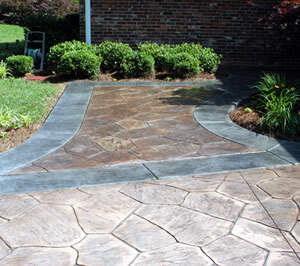 Stamped concrete does require some routine maintenance in the form of clearing debris, removing stains, etc. The best protection you can give your stamped concrete to protect its color and sheen is by having a sealer applied. Your contractor is the best one to recommend which sealer should be used. There are a variety on the market that are best for certain types of concrete, and for concrete in certain areas (high foot traffic versus high vehicle traffic). Resealing your concrete should be part of your program as well. Your contractor may even offer maintenance services. You can expect to reseal every 2 to 3 years to keep your concrete in its best condition. Any longer and the color of your stamped concrete can start to fade. There are UV protectant sealers that can minimize and virtually eliminate any fading due to sunlight exposure.